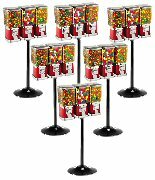 Vending Machines for Sale - At CandyMachines.com, we have a full line of Vending Machines for sale at wholesale prices. Below you'll find all of our Vending Machines that we offer. We offer a full line of Bulk Vending Machines, Soda Vending, Snack Vending, Arcade Vending Machines, and much more. All of our vending machines are made with top quality materials and come with factory warranties. Whether you're looking for a discounted vending machine for your restaurant, or looking for a vending package to start a new business, we have machines for sale that will fit your budget. Q: Can you vend toy capsules out of a gumball vending machine wheel?